UASure created the world's first hand-held blood uric acid meter on the market. Utilizing advanced biosensor technology, this easy-to-use uric acid test kit has been used successfully since 2001. Now available in the USA. 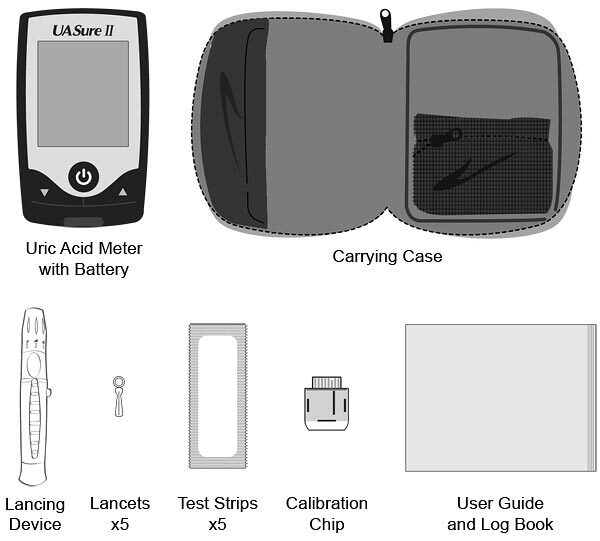 The UASure Blood Uric Acid Test Kit comes with a Hardware Meter Checker which can help ensure that the electronics in the meter are working properly. This test should be done on a brand-new meter, or when the performance of the meter needs to be confirmed. For additional accuracy verification, the optional UASure Control Solution may be purchased.